Ships built more than one hundred years ago are still sailing around Southern Norway, which will take you on a cultural journey far back in time. Once upon a time – before cars became ubiquitous and the railroad was still not fully developed in Norway – the waterways were an important mode of transport for both people and goods in inland areas. The timber was floated on the waterways from forest villages and out to the coast during the summer months, and both people and horses preferred to travel on frozen winter lakes rather than bad, twisting summer roads. Then something happened that would be revolutionary for Norwegian inland logistics and the transport of people and goods. "The first inland ships appeared early in the second half of the 1800s, and they made it possible to transport people during the summer as well," says Alexander Ytteborg to Visit Norway. He is the coordinator for the World Heritage sites in Rjukan and Notodden, and was formerly head of the department for maritime preservation and technical cultural monuments with the Directorate for Cultural Heritage. Few others in the country possess such a profound knowledge of the beautiful ships, which showed up in the inland areas when the industrialization of Norway had secured its grip on the land around 170 years ago. On the major Norwegian lakes, ships with capacity for both two- and three-digit numbers of passengers began operating along scheduled routes, while the Haldenvassdraget and Skiensvassdraget waterways got locks that made it possible for larger ships to sail far inland. 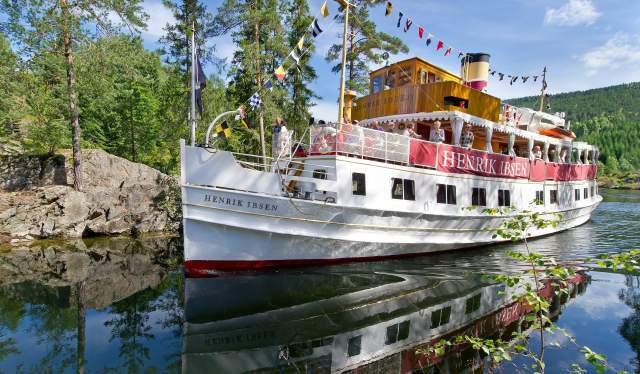 If you visit the Halden waterway, you can still take a ride on the steam-powered ship, DS Turisten, which has been sailing up and down the canal since 1887, while the beautiful MS Victoria has been in operation on the Telemark Canal since 1882. The most famous of them all is perhaps the DS Skibladner, which has serviced the route between Eidsvoll and Lillehammer since 1856. "The long and short of the Norwegian inland ships as a whole is that you'll find a huge amount of cultural history on Norwegian lakes today, and that is quite brilliant," says Ytteborg. Some of the passenger boats that currently operate along scheduled routes are transformed work boats. For example, Norway's oldest propeller-driven steamer, DS Engebret Soot, was originally used as a tugboat for the timber trade. "Serving as a passenger transport vessel was the main purpose of Skibladner, Victoria and Turisten, but this was done in combination with the transport of cargo and goods. At the time, these vessels were vital to life along the waterways - everything from mail and merchandise to live cattle and milk cans were transported on board these venerable old ships," he says. Ytteborg considers these beautiful ships as telling an important story about a mode of transportation that seems exotic and snail-paced nowadays. Not least, they say something about how significant the waterways were for people. "They are vessels that feature a historical dimension with lines tracing far back in time, and this allows you to feel what it was like to travel in earlier eras," he says. "Now, I am admittedly biased, but they are cosier than modern boats and reflect a comfort factor whereby greater emphasis was put on beauty than functionality," concludes Ytteborg. Would you like to come along on just such a pleasant, historical journey? Alexander Ytteborg helped create an overview of the historic ships that operate along scheduled routes to this very day. NOTE: You find timetables on the ships' respective websites. Not all vessels have daily departures. Skibladner has operated along the route between Eidsvoll and Lillehammer since 2 August 1956, according to the Norwegian Ship Preservation Association and served as an extension of the mail railway line between Christiania (Oslo) and Eidsvold. Skibladner was built by Motala Shipyard in Sweden, and is the world&apos;s oldest, operational paddle steamer servicing a scheduled route. "Lake Mjøsa&apos;s White Swan" can accommodate 230 passengers and a crew of 20. MS Fæmund II was christened at Ørens Mechanical Works in Trondheim, Norway, in 1905, and has serviced the route on Norway's third largest lake every summer since then. It was formerly also used for timber towing and goods traffic, but with capacity for 100 passengers, it is passenger traffic that is currently the ship's main source of income. In Jotunheimen, the MB Bitihorn has operated on lake Bygdin every summer since 1912. The boat was built at Glommen Mechanical Works in Fredrikstad, Norway, and assembled at Bygdin. The route between Bygdin and Eidsbugarden has two departures daily, and there is capacity for 98 passengers on the boat trip that takes place among enchanting mountains fully 1,060 metres above sea level. 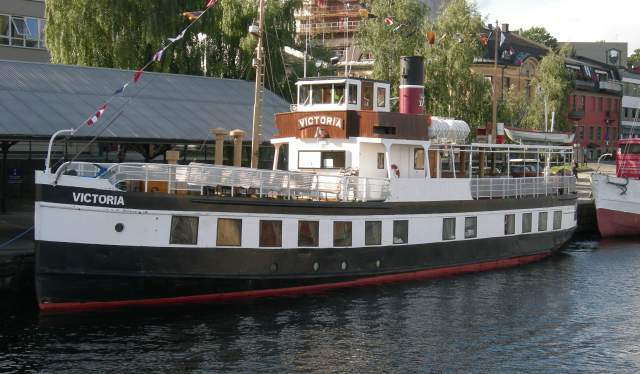 MS Victoria was built at Akers Mechanical Works in Christiania (Oslo), and has been operating on the Telemark Canal since she was launched in 1882. With capacity for 180 passengers, "The Canal Queen" - as the boat is also known - services the route between Skien and Dalen. The MS Henrik Ibsen was built in 1907 at the Eriksbergs Mechanical Works in Sweden. Originally began operating in the archipelago outside Gothenburg under the name Styrsö, and ended up on the Telemark Canal as late as in 1993. 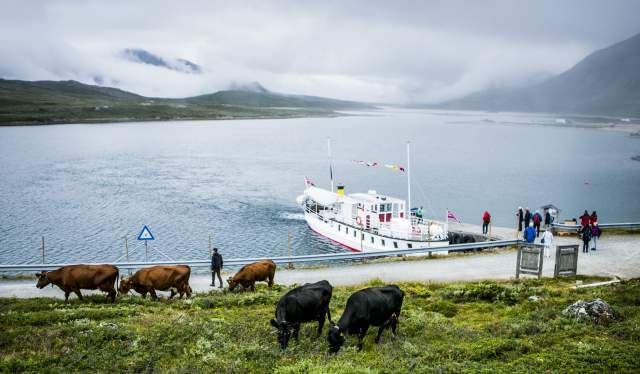 The boat, which is also known as the "King of the Telemark Canal", currently has capacity for 100 passengers, and operates between Skien and Dalen - a journey that takes 9.5 hours. The MS Telemarken was supplied by the Swedish Västervik's new shipyard in 1951, and was operating in the Stockholm Archipelago until it was moved to the Telemark Canal in 1988. It was then that the boat got its current name, and with capacity for 140 passengers, Telemarken services the route between Akkerhaugen and Lunde. DS Bjoren was built at Akers Mechanical Works in Christiania (Oslo) in 1866, and initially operated on Kilefjorden from 1867. When the Setesdalsbanen Railway was built, the ship was moved to Byglandsfjorden where it operated from 1897 to 1957. According to avtrykk.no, the ship was left to decay for over 30 years until it was restored in 1994. It is currently in operation once again along a route on Byglandsfjorden, and it is one of the few wood-burning steamers you will find in passenger traffic in the world today. MS Fram was built as a tugboat at Fredrikstad Mechanical Works, and towed timber on lake Nisser and lake Vråvatn from 1909 to 1971. After having been laid up for 15 years, Fram ended up in 1986 with new owners who wanted to put the tug back into operation as a tourist boat. According to their website, following the restoration, Fram has capacity for 90 passengers, and nearly 30 years later the boat is still operating in the summer months. DS Turisten was supplied by Nyland Mechanical Works in Kristiania (Oslo), and transported passengers and goods on Haldenkanalen between 1887 and 1963. It was sunk in lake Femsjøen in 1967, but was salvaged at the end of the 1990s. 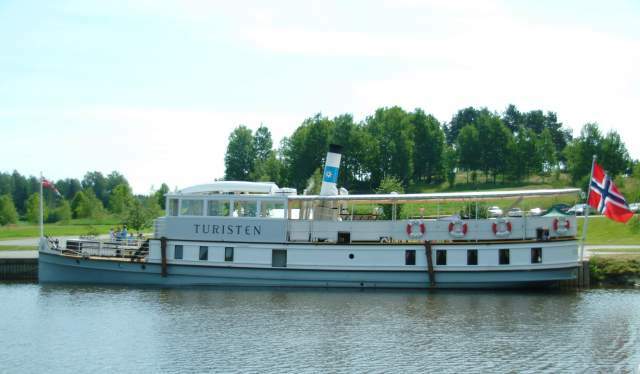 After having been restored for NOK 45 million, Turisten was back on the canal in 2009. It departs from the BåtCafé dock at Ørje. MF Storegut is an operational railway ferry, and is part of the Rjukan- and Tinnosbanen Railway. Storegut was built by Glommen Mechanical Works in Fredrikstad and is the largest lake ferry in Northern Europe. The ferry was put into operation in 1956, and its main purpose was to transport rail cars containing fertilizer for Norsk Hydro from Rjukan to Tinnoset so that the goods made it to the international market. Storegut is a part of Rjukan and Notodden's UNESCO protected industrial World Heritage site. 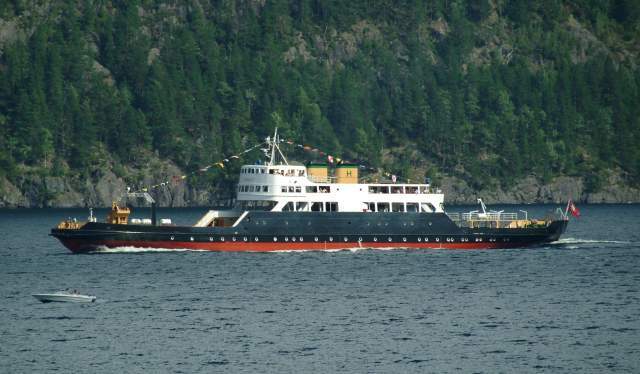 The Randsfjordferga II ferry was built at Sarpsborg Mechanical Works in 1950, and has been in operation on lake Randsfjorden between Tangen and Horn since 1972. The ferry was originally called Mjøsfergen II and - according to Digitalmuseum.no - it operated on Lake Mjøsa from 1950 to 1963. She is currently Norway&apos;s only inland ferry operating year-round. Randsfjordferga II transports both passengers and cars, and forms an important part of the county road network, which is important for local communities on both the east and west sides of lake Randsfjorden.